Home › Arabic › My first ever tweet in Arabic! 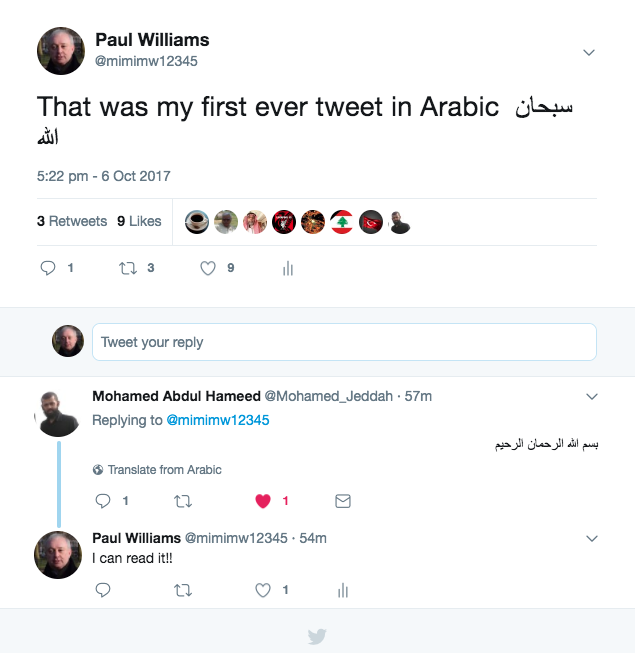 My first ever tweet in Arabic! There’s nothing to stop you from composing epic poetry in classical Arabic now. Lately, I was wondering what the proper translation is for the word سبحان. Lol, you are in the right direction bro. Arabic, especially quranic/classical arabic is a beautiful divine language. I love it to the core. Try to be able to read it first then the learn the classical grammar then acquire and build the vocabulary as you progress. This is something I try to do everyday since I turned 40 as I renewed my commitment to the faith and live according to God’s will going forward. Of course It does not mean we can not appreciate the message of the Qur’an in translation but it feel different once you understand the message in original language directly with its phonetics and poetical nuance. It almost brings me to tears everyday I perform conggregatory shalah in the mosque when the Imam recites long surah especially when the surah talks about God’grace and God’s warnings. It’s awaken me up spritually everytime finishing shalah.